The protein encoded by this gene is a member of the Ser/Thr protein kinase family. This protein is highly similar to the gene products of S. cerevisiae cdc28 and S. pombe cdc2. It is a catalytic subunit of the protein kinase complex that is important for cell cycle G1 phase progression. The activity of this kinase is restricted to the G1-S phase, which is controlled by the regulatory subunits D-type cyclins and CDK inhibitor p16INK4a. This kinase was shown to be responsible for the phosphorylation of retinoblastoma gene product (Rb). Ser/Thr-kinase component of cyclin D-CDK4 (DC) complexes that phosphorylate and inhibit members of the retinoblastoma (RB) protein family including RB1 and regulate the cell-cycle during G1/S transition. Phosphorylation of RB1 allows dissociation of the transcription factor E2F from the RB/E2F complexes and the subsequent transcription of E2F target genes which are responsible for the progression through the G1phase. Hypophosphorylates RB1 in early G1 phase. Cyclin D-CDK4 complexes are major integrators of various mitogenic and antimitogenic signals. Also phosphorylates SMAD3 in a cell-cycle-dependent manner and represses its transcriptional activity. 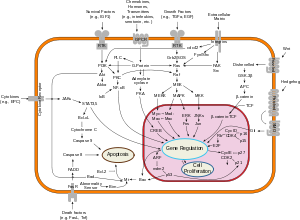 Component of the ternary complex, cyclin D/CDK4/CDKN1B, required for nuclear translocation and activity of the cyclin D-CDK4 complex. Flavopiridol are US FDA approved  CDK4 and CDK6 inhibitors for the treatment of estrogen receptor positive/ HER2 negative advanced breast cancer. ^ a b "Entrez Gene: CDK4 cyclin-dependent kinase 4". ^ "Approved Drugs > Ribociclib (Kisqali)". Retrieved 12 September 2017. ^ a b c d Ewing RM, Chu P, Elisma F, Li H, Taylor P, Climie S, McBroom-Cerajewski L, Robinson MD, O'Connor L, Li M, Taylor R, Dharsee M, Ho Y, Heilbut A, Moore L, Zhang S, Ornatsky O, Bukhman YV, Ethier M, Sheng Y, Vasilescu J, Abu-Farha M, Lambert JP, Duewel HS, Stewart II, Kuehl B, Hogue K, Colwill K, Gladwish K, Muskat B, Kinach R, Adams SL, Moran MF, Morin GB, Topaloglou T, Figeys D (2007). "Large-scale mapping of human protein-protein interactions by mass spectrometry". Mol. Syst. Biol. 3 (1): 89. doi:10.1038/msb4100134. PMC 1847948. PMID 17353931. ^ Dai K, Kobayashi R, Beach D (1996). "Physical interaction of mammalian CDC37 with CDK4". J. Biol. Chem. 271 (36): 22030–4. doi:10.1074/jbc.271.36.22030. PMID 8703009. ^ Lamphere L, Fiore F, Xu X, Brizuela L, Keezer S, Sardet C, Draetta GF, Gyuris J (1997). "Interaction between Cdc37 and Cdk4 in human cells". Oncogene. 14 (16): 1999–2004. doi:10.1038/sj.onc.1201036. PMID 9150368. ^ Stepanova L, Leng X, Parker SB, Harper JW (1996). "Mammalian p50Cdc37 is a protein kinase-targeting subunit of Hsp90 that binds and stabilizes Cdk4". Genes Dev. 10 (12): 1491–502. doi:10.1101/gad.10.12.1491. PMID 8666233. ^ a b c Lin J, Jinno S, Okayama H (2001). "Cdk6-cyclin D3 complex evades inhibition by inhibitor proteins and uniquely controls cell's proliferation competence". Oncogene. 20 (16): 2000–9. doi:10.1038/sj.onc.1204375. PMID 11360184. ^ a b Cariou S, Donovan JC, Flanagan WM, Milic A, Bhattacharya N, Slingerland JM (2000). "Down-regulation of p21WAF1/CIP1 or p27Kip1 abrogates antiestrogen-mediated cell cycle arrest in human breast cancer cells". Proc. Natl. Acad. Sci. U.S.A. 97 (16): 9042–6. doi:10.1073/pnas.160016897. PMC 16818. PMID 10908655. ^ a b Rual JF, Venkatesan K, Hao T, Hirozane-Kishikawa T, Dricot A, Li N, Berriz GF, Gibbons FD, Dreze M, Ayivi-Guedehoussou N, Klitgord N, Simon C, Boxem M, Milstein S, Rosenberg J, Goldberg DS, Zhang LV, Wong SL, Franklin G, Li S, Albala JS, Lim J, Fraughton C, Llamosas E, Cevik S, Bex C, Lamesch P, Sikorski RS, Vandenhaute J, Zoghbi HY, Smolyar A, Bosak S, Sequerra R, Doucette-Stamm L, Cusick ME, Hill DE, Roth FP, Vidal M (2005). "Towards a proteome-scale map of the human protein-protein interaction network". Nature. 437 (7062): 1173–8. doi:10.1038/nature04209. PMID 16189514. ^ Ghavidel A, Cagney G, Emili A (2005). "A skeleton of the human protein interactome". Cell. 122 (6): 830–2. doi:10.1016/j.cell.2005.09.006. PMID 16179252. ^ Guan KL, Jenkins CW, Li Y, Nichols MA, Wu X, O'Keefe CL, Matera AG, Xiong Y (1994). "Growth suppression by p18, a p16INK4/MTS1- and p14INK4B/MTS2-related CDK6 inhibitor, correlates with wild-type pRb function". Genes Dev. 8 (24): 2939–52. doi:10.1101/gad.8.24.2939. PMID 8001816. ^ Wang H, Iakova P, Wilde M, Welm A, Goode T, Roesler WJ, Timchenko NA (2001). "C/EBPalpha arrests cell proliferation through direct inhibition of Cdk2 and Cdk4". Mol. Cell. 8 (4): 817–28. doi:10.1016/S1097-2765(01)00366-5. PMID 11684017. ^ a b c Sugimoto M, Nakamura T, Ohtani N, Hampson L, Hampson IN, Shimamoto A, Furuichi Y, Okumura K, Niwa S, Taya Y, Hara E (1999). "Regulation of CDK4 activity by a novel CDK4-binding protein, p34(SEI-1)". Genes Dev. 13 (22): 3027–33. doi:10.1101/gad.13.22.3027. PMC 317153. PMID 10580009. ^ a b c Nasmyth K, Hunt T (1993). "Cell cycle. Dams and sluices". Nature. 366 (6456): 634–5. doi:10.1038/366634a0. PMID 8259207. ^ Taulés M, Rius E, Talaya D, López-Girona A, Bachs O, Agell N (1998). "Calmodulin is essential for cyclin-dependent kinase 4 (Cdk4) activity and nuclear accumulation of cyclin D1-Cdk4 during G1". J. Biol. Chem. 273 (50): 33279–86. doi:10.1074/jbc.273.50.33279. PMID 9837900. ^ a b Coleman KG, Wautlet BS, Morrissey D, Mulheron J, Sedman SA, Brinkley P, Price S, Webster KR (1997). "Identification of CDK4 sequences involved in cyclin D1 and p16 binding". J. Biol. Chem. 272 (30): 18869–74. doi:10.1074/jbc.272.30.18869. PMID 9228064. ^ Arsenijevic T, Degraef C, Dumont JE, Roger PP, Pirson I (2004). "A novel partner for D-type cyclins: protein kinase A-anchoring protein AKAP95". Biochem. J. 378 (Pt 2): 673–9. doi:10.1042/BJ20031765. PMC 1223988. PMID 14641107. ^ Zhang Q, Wang X, Wolgemuth DJ (1999). "Developmentally regulated expression of cyclin D3 and its potential in vivo interacting proteins during murine gametogenesis". Endocrinology. 140 (6): 2790–800. doi:10.1210/endo.140.6.6756. PMID 10342870. ^ Zhang JM, Zhao X, Wei Q, Paterson BM (1999). "Direct inhibition of G(1) cdk kinase activity by MyoD promotes myoblast cell cycle withdrawal and terminal differentiation". EMBO J. 18 (24): 6983–93. doi:10.1093/emboj/18.24.6983. PMC 1171761. PMID 10601020. ^ Zhang JM, Wei Q, Zhao X, Paterson BM (1999). "Coupling of the cell cycle and myogenesis through the cyclin D1-dependent interaction of MyoD with cdk4". EMBO J. 18 (4): 926–33. doi:10.1093/emboj/18.4.926. PMC 1171185. PMID 10022835. ^ Fåhraeus R, Paramio JM, Ball KL, Laín S, Lane DP (1996). "Inhibition of pRb phosphorylation and cell-cycle progression by a 20-residue peptide derived from p16CDKN2/INK4A". Curr. Biol. 6 (1): 84–91. doi:10.1016/S0960-9822(02)00425-6. PMID 8805225. ^ a b Li J, Melvin WS, Tsai MD, Muscarella P (2004). "The nuclear protein p34SEI-1 regulates the kinase activity of cyclin-dependent kinase 4 in a concentration-dependent manner". Biochemistry. 43 (14): 4394–9. CiteSeerX 10.1.1.386.140. doi:10.1021/bi035601s. PMID 15065884. ^ Xiong Y, Zhang H, Beach D (1993). "Subunit rearrangement of the cyclin-dependent kinases is associated with cellular transformation". Genes Dev. 7 (8): 1572–83. doi:10.1101/gad.7.8.1572. PMID 8101826. Hanks SK (1987). "Homology probing: identification of cDNA clones encoding members of the protein-serine kinase family". Proc. Natl. Acad. Sci. U.S.A. 84 (2): 388–92. doi:10.1073/pnas.84.2.388. PMC 304212. PMID 2948189. Tassan JP, Jaquenoud M, Léopold P, et al. (1995). "Identification of human cyclin-dependent kinase 8, a putative protein kinase partner for cyclin C". Proc. Natl. Acad. Sci. U.S.A. 92 (19): 8871–5. doi:10.1073/pnas.92.19.8871. PMC 41069. PMID 7568034. Hirai H, Roussel MF, Kato JY, et al. (1995). "Novel INK4 proteins, p19 and p18, are specific inhibitors of the cyclin D-dependent kinases CDK4 and CDK6". Mol. Cell. Biol. 15 (5): 2672–81. doi:10.1128/MCB.15.5.2672. PMC 230497. PMID 7739547. Chan FK, Zhang J, Cheng L, et al. (1995). "Identification of human and mouse p19, a novel CDK4 and CDK6 inhibitor with homology to p16ink4". Mol. Cell. Biol. 15 (5): 2682–8. doi:10.1128/MCB.15.5.2682. PMC 230498. PMID 7739548. Kato JY, Matsuoka M, Strom DK, Sherr CJ (1994). "Regulation of cyclin D-dependent kinase 4 (cdk4) by cdk4-activating kinase". Mol. Cell. Biol. 14 (4): 2713–21. doi:10.1128/MCB.14.4.2713. PMC 358637. PMID 8139570.